The Diary of a Cat now discusses cat diarrhea or upset tummy. It is no laughing matter. I’ll let you know what happened to me one day. Please stop eating at this point. We cats are hunters. During the evolution the only one who ever got us food (after we left Mommy cat) was ourselves. Every chance of getting food was to be taken. Every mouse, lizard, bowl of milk or fly had to be eaten as quickly as possible. So I have studied the SCC, followed its advice on where to lurk for food, and as a result become a very good hunter. I have eaten hundreds of house flies. I have hunted for unattended cheese from the kitchen table. I have developed the Paw Thief Technique to the utmost – they never see my paw reaching from under the table and taking that food from their plate… I have been around when the eggs were taken out of the fridge to drop them by “accident” and help clean the mess (a very nourishing procedure). And I have become especially good at hunting potato chips. Now this is a skill of its own – you need to know just the right amount of teeth pressure so that you can walk away with the potato chip unbroken. The sound of a cracking potato chip sends Mommy immediately running to my general direction. She thinks the fat and salt are not good for me. Salt terrorist, I say… But if keep my calm and only do the breaking of a chip under the bed she cannot reach me in time to take it away. But anyhow – Mommy and Daddy went to Holiday. They were off for two nights, and like before it was agreed that Daddy’s Mommy would come to check on us twice a day. She is a nice lady. She always gives us food when she comes. And she knows the value of a good nap on the couch with me. A very nice lady indeed. I heard Mommy saying she would like to try something she read in a Cat Magazine. The Cat Magazine had said, that it was best to leave a big bowl of dry food for a cat, so that it would learn to eat a little at a time, whenever it came hungry, knowing there would always be food when needed. I do believe I like the theory. “I want to be sure that if something happens, the cats have food for at least a few days”, she said. (Now I understood why she bought us a new water bowl the size of a Barbie swimming pool). And so the morning came when they were about to leave for Holiday. (They seem to like that place and are always talking about how nice it would be to go there). Mommy took a big kettle and went to The Cupboard. That’s the place where our dry food is kept. I went to help her to open the upper cupboard door as usual, standing in front of her on my hind legs with my tail at her face. She seems to like this because I always get attention when I do this. She took out the plastic container where the dry food is and I did the customary miaow-dance to let her know I was hungry. She heard GOOD this time – she poured it ALL into the kettle. I almost fainted with excitement. Hippu and Pipsa were making lambish-noises on the floor, trying their best to wrap themselves around Mommy’s ankles. They do this because she seems to like it too – she always takes notice of them when they do that. I don’t, I think we should divide the work of human handling between us and I am better at helping Mommy get our food out of the cupboard than furry-roping Mommy’s ankles. “Now you won’t eat this at once, you hear!” Mommy said. The second the door closed we ran to the kettle. Everything I had ever learned from the SCC came to my mind. I actually sat for a few seconds, savoring the moment, observing if there was anything in my mind telling I should not eat. No, there wasn’t. SCC is all about pleasant survival in the world of humans, and this topped it all. I mean what would be more pleasant than a whole big bag of dry food there for you. And no one stopping you from eating it. If you can think of something, let me know, because I sure can’t. This is as close to cat heaven any cat can think of. So we ate. And then we ate. And after that we ate some more. Then Hippu sighed and left and Pipsa and I were left to continue. Then Pipsa gave a loud burp and toitered to a nearby rug and collapsed there in a food-induced coma, next to Hippu who could only pant with his full stomach, and smile a silly smile. (I’m sure you have seen that smile – there is no blood left for the happy brains, when the stomach is working overtime). They are so weak, those two. No discipline to follow the rules of SCC. But I kept at it. “Eat all you can, as quickly as you can, it is essential to the survival of a hunter” – says the Code, and I believe I am allowed to reveal that much. So I kept my head inside the kettle and chewed and swallowed, chewed and swallowed. I tried to jump on the sofa, but somehow I couldn’t. Thank goodness Hippu and Pipsa were half-conscious and did not see when I flopped on my back on the carpet. I decided maybe it was the best place to stay for now, and did. All seemed well. We were sleeping quite content. But then something strange happened in my tummy. It began to make noises. I did not pay much attention at first. I was asleep and thought I was hearing a distant thunder. But then the voices got louder and I woke up to the urge to … go. I considered getting up, and then the embarrassing thing happened. I realized I REALLY needed to GO – but that’s all I had time to think. Have you ever seen a water-balloon splash on a pavement? It was like that. I got to my feet quicker than you could think and ran to the litter box. Hippu had gone there before me, and I could not fit in (we have this covered litter box so I could not squeeze in from anywhere else but the doorway which Hippu was blocking). So the embarrassing thing happened anew. I will not go to any details, as Mommy said she will only allow me to write my diary if I promise to behave, but think of bullets flying around. It was like that. I ran to the bathroom, the thunderous noises of my tummy not yet ceased. I made it into the shower area before it happened again. Think of what happens when you use a blender and forget to put the lid on. It was like that. As the damage was already done, I did what I could to clean it up. I went to the softest carped Mommy and Daddy have, and sat on it. Then I lifted by hind legs in the air and pulled myself forward with my front legs to clean my behind. But even after that not all was clean. I simply had to use the traditional cat method of cleaning myself. She saw me, shooed me into shower, not touching me, and washed my hinies, the blessed woman. Then she took rags and all kinds of cleaning things and spent a long time making the apartment decent for cats to live in, again. But she did not give us food this time, which we did not quite understand. I heard later that Mommy and Daddy bought her a gift card to a spa to make sure she would come to take care of us again the next time they need to go to Holiday. Mommy also promised she would never leave dry food out in the open again. Now, you may wonder why I chose to tell this story in my Diary of a Cat. After all this is rather an embarrassing thing to reveal. I only tell you all this as a warning - cat diarrhea can be very dangerous to cats also, not just the surroundings. The SCC is quite clear in the rules of hunting and eating, so it cannot be wrong. I did what I was taught to do, and still this accident happened. I can only blame the cat food. It must have gone bad. I am considering on making an official complaint to the cat food factory. The food-hygiene could obviously be better there. 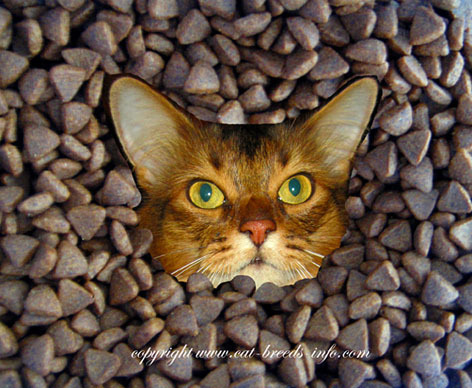 I wish this section of the Diary of a Cat by Rolli the Somali Cat will remind you to stay alert to the dangers of spoiled food. Do you wish to leave Rolli some comments about the Cat Food Disaster? Ok, now we do hope your pictures in this particular article won't show a similar situation in any given home. Keep the pictures nice and clean. Click the button and find the first one on your computer. Select it and click on the button to choose it.